Surprise a friend with this super-cute cactus card! Betcha never knew that making a pop-up card could be so easy. Check out our video and instructions, we’ll show you how very simple it is. Just make a few cuts, add a few stickers and glue on a bit of paper. That’s all there is to it! 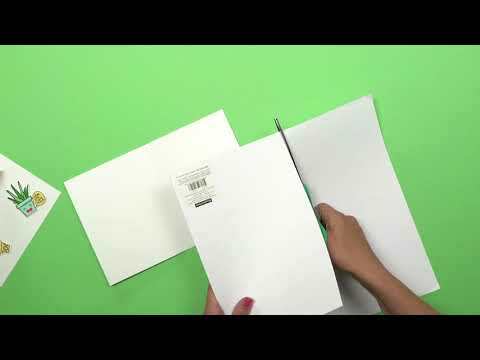 Start by folding one of your note cards in half. Now, let’s cut three pop-up panels into the card’s folded edge. Measure to find the center point along the folded side of your card. Make a 1" cut on either side of the center point. Both cuts should be about ¼" away from the center, so that this pop-up panel is about ½" wide. Next, measure 1" from either side of the center pop-up panel. On each side, cut another set of two 1" cuts to make the second and third pop-up panels. TIP: When you’re done, you should have three sets of cuts (that’s six cuts total) evenly spaced along the fold of the card. Pop each panel forward, so that all three pop out on the inside of the card. Sticker time! Add one adorable cactus sticker to each pop-up panel. But don’t stop there, add more cute stickers onto the inside of the card. Next, measure and cut your cactus-printed sheet of paper so that it’s the same size as the front side of your card. Finally, glue your cactus paper to the front of your note card. Don’t forget to write a sweet note inside! Super-cute! Gold Cactus Paper by Recollections®, 12" x 12"
Value Pack Cards & Envelopes by Recollections®, 5" x 6.5"